Utah Scientific offers a wide range of control panels to suit any type of routing switcher application. Whether you need a completely customize-able, software-based GUI panel, a simple single-bus hardware panel in which you can push a single button to select a source, or a sophisticated, multi-bus, multilevel control panel that can operate the entire routing system, Utah Scientific has the panel to fit your exact requirement. The UCP-LC Series is a completely new approach to router control panel design that provides a “soft” user interface through dynamic labeling of LCD switches and touchscreen displays. Utah Scientific’s UCP-LC router control panel family features dynamic labelling of high-resolution LCD switches to provide a completely “soft” user interface. These panels are driven by a unique user-configurable menu system that offers a very powerful, yet user-friendly means of controlling any routing system. The UCP-LC80 panel has 80 user programmed high resolution multi-color buttons.The panel uses dynamic labeling of LCD buttons to privde a completely “soft” user interface. Panel setup is driven by a unique configurable menu system providing a powerful yet user friendly experience. Flexible menu layering provides quick access to any established panel configuration. All buttons are fully programmable for any function such as source, destination, salvos, level mapping, audio attributes, protect/lock, paging, and breakaway switching. The UCP-LC32 panel offers 4rows of programmable buttons with eight characters and user definable colors. The flexible, 32-menu layering structure provides fast access to a variety of panel configurations. 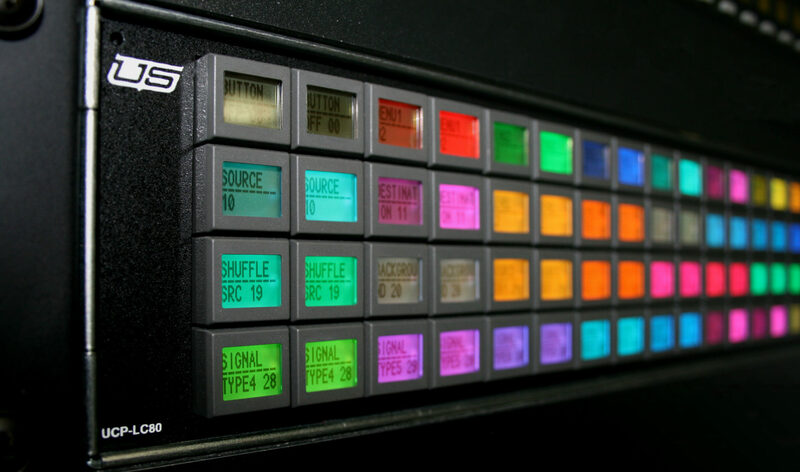 All buttons are fully programmable for any function such as source, destination, salvos, level mapping, audio attributes, protect/lock, paging, and breakaway switching.